Why can't I get the hinges in where they are supposed to go? what type of material should we be printing with? What strings do people recommend for this? I can't get the strings on mines to have that much tension. hi please help! !, how thermoforming the palm mesh if my hand_body-no_thumb?? Thanks. So I'm trying to figure out the thumbless version. The palm mesh appears to be for the full hand version. If the patient has a thumb, how do we work around the palm mesh? They don't want to enclose their thumb inside the hand. Same question also applies to the velcro pouch. How do you make that work with a person with a thumb? Can we print the hand without supports? Hi, I am currently working on the ironman hand for a little girl...it is the hard plastic but it uses similar fingers in the flex material. I am trying to find someone to print the fingers because I do not have the material needed. Can anyone on here help or know someone who can help? Would any one know where i could find a model like this but with seperatly controlled fingers. The only other models with individually controlled fingers that i could find were either relatively blocky or not shaped like a normal human hand and i was hoping to find something that was more 'hand like'. Something kind of like these but more realistic. Is there a specific supplier for the tendons, screws, straps and orthoplastic foam padding? Are there other supplies needed? what size Chicago screws? We have two children 4 and 6 that we are trying to supply with a hand. It is being done by 7th and 8th graders as a community service project. Any specific instructions would be appreciated. Is there a kit for the supplies? That might be much easier than individually trying to purchase the items. If there is a kit, where may we purchase it? That is sooo cool! can you print it with a MakerBot? Also, how many parts are individually printed? Hi I just wanted to write to commend you guys in what you did, I have read the story about how this hand came about and am very humbled by it. I have been researching all week since coming across e-Nable and what they do which instantly inspired me to join up and be a fabricator. I hope you dont mind me using your flexi hand as my first print to send to them for recognition as a creator. Hi, I am wondering have you printed this hand? I am currently working on the ironman hand for a little girl but it uses similar fingers in the flex material. I am trying to find someone to print the fingers because I do not have the material needed. Can you help or do you know someone who can help? To make this object, do I have to print all the files? Really Cool! Just a Suggestion: Make another one with a low poly exterior! Filaflex is 82A or 95A? I want to scale this hand more than once, for a project. Not just the one time, but automatically, multiple times. I know how to scale things in AutoCAD with the simple "scale" command (or the Gizmo), but I would like to be able to do this without having to write the entire sequence every single time. I haven't found anything so far to suggest that it's doable, other than that you can make AutoCAD scale things to a fixed factor whenever you import files, which I haven't been able to figure out (self taught, in a hurry), and isn't really the best option for me, because I'd still have to input multiple commands and this should be automatic if possible. Is it even possible? If yes, how? Is this even the right place to ask? You can scale in the slicer when you come to 3D print an object too. But can I do it automatically? Without having to input multiple lines of code, or more than one command? I'm self taught (in a rush), so I might be asking some stupid questions. May I use your picture in a blog post about prosthetic hands? Yeah sure, please attribute back though. Sure, nice writeup and some well said points, I work for Open Bionics and so we are further than most to turn 3D printed bionic arms into a real National Health Service item. Do you have a video on how to do it? I am making the ironman hand for a little girl and uses the same flex material on the fingers only. How would you suggest using the hot glue? Use wax to stop the hotglue from sticking in the mold. Ok, y'all. I'm in the middle of printing this thing. Here's what I've accomplished thus far PLUS some tips! Hinges: 2 hours, 18 minutes / 10% infill / no supports / 30 speed / 230 extruder / 70 bed; TPU (multiply to get more to choose from for good fits). Cording: 10lb rated hemp cording / Joann Fabrics Item #2352938. *Note: the best way to fish the cording through the small holes is to take a piece of FRESH (so no break-offs inside hand piece) 1.75mm PLA and work the holes back and forth to get any obstructions cleared. Continue to do this till it's clear, discard PLA piece and THEN you can fish the cording through. Hold hand upright when you fish cording through holes; gravity will do its thing. Dollar Store superglue gel (gel works best). Aqua Net Purple for glass bed adhesion. It does not hurt to clip / trim the TPU pieces to fit in the grooves better. Mash them down in with a flathead screwdriver AFTER you put some superglue in. Don't finalize all pieces together (finger pieces) till everything is dry. For a better understanding, check out the attached photos! I am trying to create the flexy hand all in flexible filament and I tried to print it with the default Ninjaflex settings as a test but it didn't lend itself to the parts. I saw that 3d central created an arm like that can you provide the printing profile settings for the parts for flexible filament? Its all done by volunteers, so doesn't cost any money. Someone would happily offer tips and advice on there if you want to just print it yourself too. Wanting to make this for a kid. How do I know what fit he needs without just printing and reprinting all the time? Has anyone ever made a Flexy Hand on someone who has a wrist and a partial thumb. I am a prosthetic/orthotic resident, and I am trying to build a 3D printed hand for my little cousin. We have a 3D printer in our clinic so I am interested in building it myself. Her thumb is stunted in growth and does not function like a normal thumb, so I don't think the thumbless model is the best for opposition. If anyone has made a hand like this before or has a recommendation I would greatly appreciate your help! I've made several. Created a thumbless version for a kid with a thumb and it didn't provide enough grasping. I would suggest sizing up so the device can fit the thumb that your cousin has and enclose the whole hand in a velcro glove. Go with the opposable thumb for the best grasping ability. What parts do people recommend for this? Flex hinge filament? Is FilaFlex still the best choice? Are all of the parts printed in FilaFlex or just the hinges? If so, can the rest of the hand be printed in PLA? Would TPU work for the hinges ? FilaFlex is TPU. TPU comes in a wide range of flexibility so you'd want something similar. "Please see dimension drawing of the palm socket and scale all the stls to suit your particular size requirements." What does this Sentence mean? I cannot find a data with the name "dimension drawing". Does it mean that i have to mesure the Arm of the Man and adjust the size? For those who want to cast the hinges, use soap to easily remove from mould. i used sanitary silicone, but seems to be too flexible. i will try to make the hinges smaller and wider, to give them more strenght. i will post the results. My daughter printed this at school so she could assemble it and give it to a friend who is missing her hand (but has her wrist). Her teacher had the hinges printed of a flexible material in Canada because they didn't have access to the right material at the school. Unfortunately I don't think the hinges were made of the correct material since they have all broken about 30 minutes after we installed the fingers. Do you know a place we can purchase just the hinges made of the correct material? We also have the mould, but not sure what material to put in the mould. Any help / direction is greatly appreciated! Do you have a list for the layer height infill and perimeters used for this design??? What is the durometer of the hinge material? What pieces do I need to make it? There are so many! Also, can you make an assembly video? Hello, to make the joints i used Dow corning 732 multi purpose silicone and when the silicone was dried, i was not able to remove the hinges from the mould without ruining either or. is there a material that i should use? or should I coat the mould with a material to make the extraction of the joints easier? Other people have had success using talc powder or olive oil as a release agent on the mould before use. How long do the joints last using the Corning 732 silicone? My 3D printer didn't correctly print the base of each finger except for the thumb, is there anyway that i could isolate the base of the fingers without having to print the whole left hand finger plate? if it helps, I'm using the makerbot replicator. would you please help me where I can find it? Look under the Instructions section along with the images in the gallery reel above. Thanks for the very fast reply! Hi. Just finished printing and assembling Flexy-hand2. Main body is in PLA. Finger hinges in filaflex. Tendons are 2mm strimmer line (very little friction). I had to reroute the cable through the hand body since, despite lots of boring out and using fine wire, I could not get the line through the printed palm. Since I took a more direct route I reckon that friction is further reduced. The hinges printed out well on my Hephestos2. The concern that I have at the moment is that each tendon requires a force of 30n(3kg) to close it. I haven't gone on to build an arm attachment yet because I am assuming that that is an unusual amount of force required to close the fingers? Ultimately I would like to build a Kwawu Arm by Jacquin Buchanan. I am heading out to Tanzania in mid January and would really like to have a fully working model by then to demonstrate with. I have started printing an Unlimbited arm (fingers in Filaflex since only black filament I have) so far ok. Any help/advice would be much appreciated. Hi, I was wondering if you might be able to help. I was looking to print a hand for a friend, but have realised most of the printable designs require a elbow or wrist joint, which he does not have. What material did you use for the tendons? I've been unable to find the right kind. Search for "nylon blind cord" and you want about 1mm diameter. Sorry for the inconvenience, try to download your design but not download. I really liked the design so that my students understand about human physiognomy, would be a great help to my students. Save the why not download your design me or if I have to pay for ??? Are you sure? You just click the "Download all files" button. Maybe Thingiverse was having an offday. Thanks, download it, this program is suitable for inaccuracies with your design 3d SketchUp, or need one especially ??? Thanks, again. Quick question, Do the fingers from the original flexy hand fit with this version? No Inventor files exists, this was designed in Meshmixer. WOW. I have a friend whose son is missing all his fingers and they can't afford a prosthetic. Will this work for that, or are the fingers necessary? We just printed the hand body and we had to size it down a bit. I am now trying to print the finger plate but don't know how best to size it to the same dimensions so that it fits appropriately. Any advice? Can you size the fingers to the same percent age that you size the hand body to? This is amazing! About how much time would it take to print? Military Hospitals should have this technology to help wounded soldiers. Hi, it is recommend to print using PLA or ABS ? Hi, I was wondering how many spools of filaflex I should purchase? How many spools of PLA? One spool of Filaflex will last you ageas, it is just for the hinges. You can get about 3-4 hands out of a 1kg reel of PLA. This is amazing prosthetic hand. Thanks for sharing the files! Hello, I have a gentleman I work with who would like for me to print one of these for his hand. He is missing all fingers from his right hand and part of his palm. He does have a portion of his thumb. I have printed the RH body and the wide version. The wide version is the best but I need to widen the portion by the flexible wrist joint and a little through the thumb detail. Any chance I could get a STEP file of the RH wide version so I can better fit it to his hand? Hello I am an engineering student developing a prosthetic for senior project at Ferris State University in the states. Would it be possible to get a file format other than .stl? I'm modeling in creo and I'm not sure if the conversion will be high enough quality going from a triangle point cloud to a solid we shall see I'm testing it now. This prosthetic is entirely open source and free to modify correct? Of course giving credit for source models utilized. Push comes to shove it looks like blender is capable of directly modifying the mesh faces. 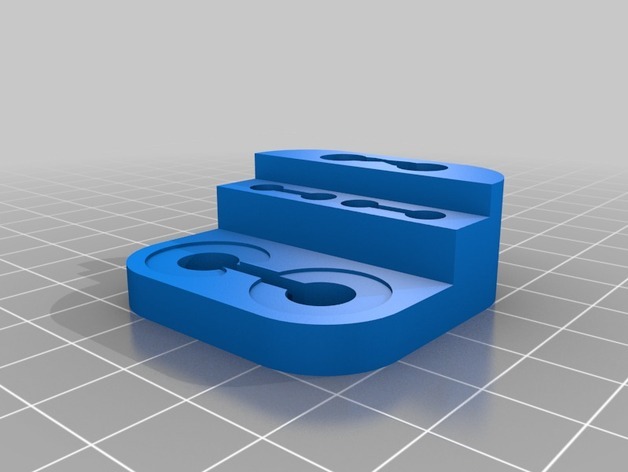 Was wondering if anyone has any suggestions for an alternative to the flexy material hinges (Since I don't have a printer that can)? The printer you used for printing filaflex flexy hand had direct extruder or a bowden tube? Alright thanks, Can you guide me in deciding the measurements? In raptor hand I scaled the hand size according to the receiver measurements of the palm by a formula they provided. Can I apply the similar on the files you have provided? There is a picture above which shows the dimensions of the palm socket when printed at 100% scale. You will need to measure the various parts of the recipients hand and see whether the printed hand needs to be scaled up or down. I always recommend printing the thermoformable gauntlet which is faster and stronger, then heated in hot water and bent around the recipients forearm to fit (see instructions). I want to print thermoformable version of wrist. I need to know when I just need to bend it over the recipient hand, how would I know the actual sizes of fingers,palm and gauntlet? How can I scale up or down? 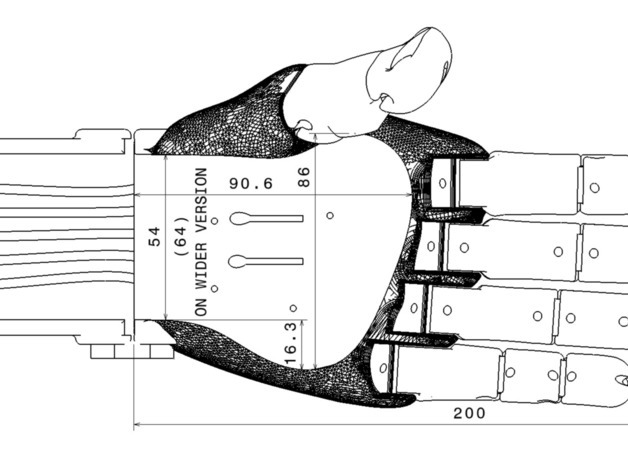 I understand that the thermoformable version is to replicate the original palm, but I am unable to understand its measurements. Now i need little more help, i have printed all of necessary parts to complete full hand but my "FFX_-_Flexy-Hinge_Wrist" can't work properly with my PLA printed "Gauntlet", it's fit properly but pull out when i try to bend wrist. So, how can i fix it? Another question for join "7"
Can i use superglue or anything else. Yes, please glue the hinges in place as the instructions state. Quote: "Glue these hinges in place with a strong glue." Great design. We've printed a raptor to be used in a previous exhibit, but wanted to update the look. So far we've printed the hand/body, and molds. The gauntlet has given me some trouble but I think that's user error. The hand printed nicely without supports, but during it's initial build, of about 5% or so I hot glued 4 points around the base to help with balance worries. So far so good. Thanks for this. If we end up using this in the case, I'll be sure to pass along the credit. I have printout Gauntlet_-_Short with Filaflex, but it is destroy my upper 30%. is it ok if i print it with PLA..
Another thing is it ok if i print tensioner in PLA? Yes, they are all PLA parts, or any other rigid filament, except for the files that are prefixed "FFX - ***"
I print three part for a full finger and two joint but when i am going to bend it frequently it pop-out from socket. do i need use super glue or epoxy to grave the socket more tightly or i need to print socket slightly bigger then it has. I never need to use glue, but sure, you are allowed to use glue if you want a more secure finger, it's your call. Impresionante trabajo, enhorabuena y, como dicen los compañeros, MUCHAS gracias! What size and type of screws are used for the tensioners at 100% scale? what is the best cartridge for this? it's ok if I using nylon and infinity? what is the sizes of this? can you give me the details? every piece of the flexy. thanks :) and I'm using cube pro trio? is this possible to print this one? I'm trying to make a cost estimate of this Thing. Can anyone give me an estimate on how many grams of filament, the types of filament, are used? I'm not familiar with the units gbp, could you please describe? I found Filaflex available at Recreus. Is it necessary to purchase a special extruder for it? We have the MakerBot Dual Extruder. GBP is standard currency abbreviation for Great British Pounds. The list of STL files seems to be missing palms for opposable thumbs for normal width wrists. The set of STLs is so complete, I suspect that I am missing something. Any pointers? a) It was bad idea to print it with 0.3 mm high layers instead of 0.2 mm. The printing had incidents and defects that I had to correct by carving and soldering some parts of the palm. c) Maybe was such a bad idea to use fishing line for the tendons even though I bought the strongest line available in eBay. d) I couldn't calibrate the tensors due to the flaccidity of the fingers. e) Last and very important nonetheless: I didn't use support material for all the parts of the fingers. I still hope that this hand can be salvaged and be given away to somebody who may need it. Would you people be so generous to give me some heads ups? I am thinking to make a new one after knowing what my mistakes were. Your opinions will be greatly appreciated. Hello again, After finished assembling the hand I noticed that the fingers are flaccid due to the hinges are a little bit large or deformed; this happened because forced too much the hinges out of the molds; maybe I should have put some vaseline in them before to put that putty mix that takes like 20 minutes to get hard, I let them stay one hour but the results were no good. Vaseline helps to install the hinges on the fingers parts very easily but the resultant grip is not the best. Your opinion will be greatly appreciated . Hello, I finished printing most parts of this hand and I'm working on the mold for the hinges. I understand that I am going to be able to bend to curve the gauntlet without break it by heating it in hot water: Could you please tel me how much hot should be the water? How much time should be the gauntlet immersed in hot water in case a pot is required? . I'm using regular quality PLA 1.75mm. My Flexy hand is not as perfect as others made here because I had hard time trying to take off some of the support material and unblocking the tendons channels ; I am making this hand with a "troglodyte" Prusa I3 that I made myself but I still believe that is going to be useful for someone who needs it. I'll publish pictures of it as soon as it is finished. Thank you much for your help. The water should be 60-100deg. ie near boiling, poured onto a dinner plate or baking tray. Wear gloves (ie rubber), although my fingers are ok with this water for the short time you are handling the hot plastic. Practice with some old prints first so you can get an idea of the time, if it doesn't form to the perfect shape straight away then re-submerge and re-bend. Hi Steve, I finally printed the gauntlet with PLA and its finished as same as the tensors. The hand is almost assembled except for the Velcro parts which I haven't decided to affix either with four screws or to make a piece of silicon using the two channels in the middle of the hand as mold ( I need to calculate the thickness of the velcro so the piece of silicon reach down to the bottom, and don't know how to do it yet). I'm going to use fishing line for the tendons. Also I need to know what is the theory regarding the tensioners. Do they help to retract the fingers to a straight position or the hand is normally flaccid? (the tensioners have a tubing and a sort of turning point inside). Your insight at this point will be immensely appreciated. By the way, I feel proud of my hand already. Thank you. I just bought a printer so I could make one of these... Yikes! Hello , my name is Nazareth and I would like to learn to do this project my question is what kind of printer is needed to print all the parts , I 'm from Mexico and I would love to help many people with this great project !. I want to ask which material can i use for the hinges since i have a zortrax but doesnt print ninja flex material. How do you make sure the wrist hinges do not come out or the fingers do not slide off the hinges? Is any glue applied? Hi, you can apply glue to the finger hinges if you want a more permanent fixation. However it is recommended in the instructions that the Gauntlet hinge is secured with strong glue. Aesthetically pleasing, much sexier than the robohand, and cyborg beast imho. Has anyone built this with ABS? also what is the bulid size for the biggest piece. I have an U Plus 2 that can build up to 140mm only. will this work. I'm using ABS, I think the size is already set. No IGES files exists, this was designed in Meshmixer. While printing the finger plate i had the lower sections on the index and middle fingers mess up and they wont attach properly. Are there individual files for each section I can print so I don't have to print the entire finger plate again? after very thanks and grateful Sir i would like to say you the second generation of flexy hand is really great and one question please . how many kilo gram this hand can carry ? Is it possible to provide a version for a hand where the thumb and index finger are functioning? The thumb and index fingers do function. Yes, I know. But what I ment was that I'm looking for a design which excludes the thumb and index finger, because these are 'present' on the hand. Print off the Thumbless version and dremel off the printed index finger to suit your recipient. Hmmm That will work... I'm going to do the same... Unless I figure out how to modify the design. Flexy Hand is getting some press. I made one for a two year old boy named Henry and my employer (Intel) did a story about it internally. It is now available externally at Intel Free Press. B) I did say the words Flexy Hand and bunch of times, but none that made the 2:30 piece. Sending props your way as much as I can. Has anybody made a video tutorial on how to assemble your design? Something like the assembly video tutorial that Jeremy Simon shows for the different types of hands available at E-Nabling the Future (http://youtu.be/5HVwC3RnWXk). That would also be really great! Thank you. If the printing is better but I can not print Filaflex because when the material reaches the peak it does not, strangling everything in the way the material. I'm seeing a little cursing I can print. But I want to do the hinges just because I have all other printed pieces I thought of using the mold and melt the material. Have u considered buying silicon mould and using the template supplied? Hello. A query. I have everything printed, just missing me filaflex hinges. Filaflex melts at about 200deg C. For printing it is best at 230deg C.
would it be possible to modify the tip of finger to include some "fingerprint" (lines or circles) printed with soft material like filaflex. this would allow to dampen contact of the hard plastic and reduce noise. the same could be also done at joints from the palm piece and the first finger piece. eventualy coating the inside if the hand with a layer of filaflex would be great. Do you just scale down to get the Mini Flexy-Hand 2, or how would I go about making one. For the main parts: PLA, ABS, Filaflex, Nylon etc. But the hinges have to be made of flexible material, eg Filaflex. It would be great to have a version with a removable backplate (dorsum) which could be texturized or customized by the end user... It's a beautiful prosthetic, I would like to be able to make it beautiful and an expression of the individual wearing it. Hi there. I made Flexy-Hand 2 using a PolyFlex. However, the PolyFlex was too solid to this. Therefore , it was very hard to make a base of the thumb. the base of the thumb, I hope the insertion by sliding the same way as the fingers. Hi there. What kind of screws takes to grab the tension? Any kind of woodscrew should grip into the tensioners at the right size. i.e 3.5mmx25mm if you printed at 100% for example YMMV. what is the weigth of the whole hand? What could be a good infill percentage? Sorry, not sure about weight, I have never weighed one. Regarding infill. I slice the hand with Craftware @ 10% infill. I use the "Infill Angle Increment" option which is great for supporting the top surface layers whilst maintaining a sparse density. Check out my tweet : https://twitter.com/gyrobotuk/status/493417221071581184 to see the difference. 1) Mould.stl file it for? which meets function at hand. 2) FFX -- Bat_Connection Orientation_1.stl, printed in PLA or FILAFLX? Both questions are answered in the instructions. Mould.stl file is if you want to cast your own hinges. Bat connection is printed in Flexible filament, I print with Filaflex. Also see video, "Fitting a palm glove", link above. Could be able to get a 3d model of the assembled hand? i would like to make a mechanism study on catya, to see how it works under different forces aplied. but cannot move his/her hands or fingers? Hi, not personally, the e-NABLE organisation (of which I am a member : http://enablingthefuture.org/) has lots of different projects currently in design. We have elbow actuated hands, but these are for people who have no forearm. We also have myoelectric arms but again, these are for arm less recipients. Maybe you could join the e-NABLE group and also ask on their Google+ community. Could someone possibly separate the finger parts into separate files? My printer cannot get through the long print successfully, so it would be nice to be able to print one part, or atleast fewer parts, at once. Hi, you could always print, and dremel the thumb off (from the printed hand, not yours haha) and see if it fits? I will be looking to incorporate the extra thumb base hinge soon, which will have the benefit of making the thumb removable. Trimming the thumb or another part can produce a sharp surface, maybe it can cause an abrasion on the skin of my hand. Better i will search for another solution. If you don't find a solution you are welcome to test the removable thumb version when it becomes available. This is an amazingly well-made design! Thanks for sharing the 3D files with the world! thank you very much ... Another query. Hand printed with this handout? percentage of filler that has printing? with that type of material was printed, PLA, ABS? Wow, fantastic. I've made some tweaks to the robohand design and have wanted to make something that looked more like a hand but my surface modeling skills in Solidworks are non-existant and trying to scan my hand with a CMM is a little complicated, lol. I too would also love it if .step files (or something in SolidWorks format) was uploaded. Are their any existing design flaws that would be easier to tweak with a more powerful program like Solidworks? In the description, I state it was printed on a Witbox. Great design for a very important social problem, another Filaflex demonstration by Girobot. Dear, Can you please describe the proper usage of FFX_-_Bat_Connection ? How it is mounted, material (Flex or solid). Mounting hand inside the FlexHand? Hi, you can see it in the CAD renders above, also the instructions are in the instructions tab under the "Glove" section. How long will this take to print? I want to make one of these for a poor woman I know in Honduras, she is very poor and supports herself by sewing but does so with two stubbs because she has no hands. She's pretty amazing. I'm going to have our people talk to her and see if she would be interested. Have you given any thought to the control mechanism? Hi, I am not sure what you mean by control mechanism? The gauntlet straps to your arm and the printed hand straps to your own via a "glove". The flexion of your wrist closes the fingers. We printer the body hand without support worked great, also printed with rist part without support, moving onto fingers now. Are the design files available for modifications? Or import into openSCAD, or remix in Meshmixer again. Anything in particular you want to do? You designed the hand in Meshmixer? That seems like a great deal of work. I wanted to redesign the hand around a specific user's needs, But starting almost from scratch with STL's is an unappetizing thought. Better to start fresh in Solidworks, than chisel away in meshmixer or Blender. I printed the finger plate (right), but it's unclear which segment is which in the hand drawing. Is there a chart I'm missing where each of the segments on the build plate is correlated with its item number in the hand drawing exploded view? Thanks in advance for the help. More feedback. Since I don't have a Makerbot (for shame! ), I got a friend of mine to print the hinges in Makerbot Flexible Filament. He decided to print them with 4 shells and 40% infill, which was fine for the joints between phalanges with grooves but I could not get them into the base of the hand without breaking them. I have him trying again, this time with your suggested settings; I'll let you know how it goes (and then the pictures will come!). The ones that go into the base are a bit of a pain. A thin flathead screwdriver is a useful tool and a bit of liquid soap which you can wash off afterwards helps. Also I used Filaflex, so I am not sure how elastic the MB stuff is with my settings. Basically you want them almost hollow so they squish easier, but enough perimeters so that the finger returns successfully. You could always print off my hinge mould and cast your own with silicon caulk. Got it to work with Makerbot flexible filament and 2 shells with 20% infill, for the hinges closest to the hand. It's a little "squishy," so I might try the caulk method, anyway. We'll keep playing with it. Will try some other settings for the flexible filament, as well. Most of it is a process of elimination. The shortest segments are for the small finger. For the index and ring finger, the phalanges that fit onto the base of the hand are different in shape enough for you to distinguish by their curvature with the hand body. The last four phalanges that are left don't really matter, it's your personal preference whether you want your index finger longer than the ring finger. By the way: I tried printing the hand body at a 45 degree angle as suggested and my printer (a Dimension SST 1200es) removed most of the support material (it's awfully picky about overhangs). I imagine that a Makerbot would have no trouble at all. Don't worry; pictures are forthcoming. Thank you for all of your high quality hard work!! Another great looking design - I just started printing one so I'll bring it to the hackspace when its done. Hi, in the instructions, it is suggested to use M2.5 machine screws. Buy long ones, then you can snip to the length you want. I still had to clean out the holes in the tensioners though, so there is scope to use alternative threads and/or sizes. The print looks great!! was there any sanding done? What setting did you use for the Fill, Layer thickness, Shell,and Speed? Amazing. Thank you for your hard work! Flexy-Hand 2 by Gyrobot is licensed under the Creative Commons - Attribution - Non-Commercial - Share Alike license.